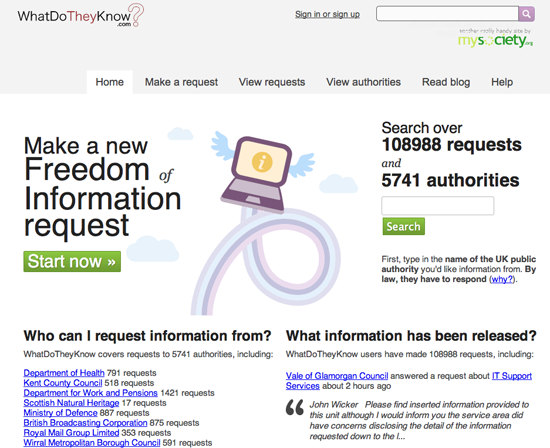 Before you make a Freedom of Information (FOI) request you should check to see if the data you are looking for is already available — or has already been requested by others. The previous chapter has some suggestions for where you might look. If you’ve looked around and still can’t get hold of the data you need, then you may wish to file a formal request. Here are some tips that may help to make your request more effective. Think about submitting a formal access request whenever you set out to look for information. It’s better not to wait until you have exhausted all other possibilities. You will save time by submitting a request at the beginning of your research and carrying out other investigations in parallel. Be prepared for delay: sometimes public bodies take a while to process requests, so it is better to expect this. Before you start submitting a request, check the rules about fees for either submitting requests or receiving information. That way, if a public official suddenly asks you for money, you will know what your rights are. You can ask for electronic documents to avoid copying and posting costs, mention in your request that you would prefer the information in electronic format. That way you will avoid paying a fee, unless of course the information is not available electronically, although these days it’s usually possible to scan documents which are not already digitalised and then to send them as an attachment by e-mail. Find out what your rights are before you begin, so you know where you stand and what the public authorities are and are not obliged to do. For example, most freedom of information laws provide a time limit for authorities to reply to you. Globally, the range in most laws is from a few days to one month. You make sure that you know what this is before you set out, and make a note of when you submit your request. Governments are not obliged to process data for you, but should give you all the data they have, and if it is data that they should have according to perform their legal competencies, they should certainly produce it for you. Usually the law does not require that you mention the access to information law or freedom of information act, but this is recommended because it shows you know your legal rights and is likely to encourage correct processing of the requests according to the law. We note that for requests to the EU it’s important to mention that it’s an access to documents request and it’s best to make a specific mention of Regulation 1049/2001. In all countries, it is better to start with a simple request for information and then to add more questions once you get the initial information. That way you don’t run the risk of the public institution applying an extension because it is a “complex request”. A request for information only held by one part of a public authority will probably be answered more quickly than one which requires a search across the entire authority. A request which involves the authority in consulting third parties (e.g., a private company which supplied the information, another government which is affected by it) can take particularly long. Be persistent. Try to find out what data is collated. For example, if you get a blank copy of the form the police fill out after traffic accidents, you can then see what information they do or do not record about car crashes. Before you submit your request, think: is it in any way ambiguous? This is especially important if you are planning to compare data from different public authorities. For example, if you ask for figures for the past three years, some authorities will send you information for the past three calendar years and others for the past three financial years, which you won’t be able to directly compare. If you decide to hide the your real request in a more general one, then you should make your request broad enough so that it captures the information you want but not so broad as to be unclear or discourage a response. Specific and clear requests tend to get faster and better answers. If you are unsure where to submit your request, there is nothing to stop you submitting the request with two, three or more bodies at the same time. In some cases, the various bodies will give you different answers, but this can actually be helpful in giving you a fuller picture of the information available on the subject you are investigating. Increasingly requests can be submitted electronically, so it doesn’t matter where you live. Alternatively, if you do not live in the country where you want to submit the request, you can sometimes send the request to the embassy and they should transfer it to the competent public body. You will need to check with the relevant embassy first if they are ready to do this — sometimes the embassy staff will not have been trained in the right to information and if this seems to be the case, it’s safer to submit the request directly to the relevant public body. If you are planning to send the same request to many public authorities start by sending an initial draft of the request to a few authorities as a pilot exercise. This will show you whether you are using the right terminology to obtain the material you want and whether answering your questions is feasible, so that you can then revise the request if necessary before sending it to everyone. If you think that exceptions might be applied to your request, then, when preparing your questions, separate the question about the potentially sensitive information from the other information that common sense would say should not fall under an exception. Then split your question in two and submit the two requests separately. If you live near where the information is held (e.g. in the capital where the documents are kept), you can also ask to inspect original documents. This can be helpful when researching information that might be held in a large number of documents that you’d like to have a look through. Such inspection should be free of charge and should be arranged at a time that is reasonable and convenient for you. Make your request in writing and save a copy or a record of it so that in the future you are able to demonstrate that your request was sent, in case you need to make an appeal against failure to answer. This also gives you evidence of submitting the request if you are planning to do a story on it. Speed up answers by making it public that you submitted a request: If you write or broadcast a story that the request has been submitted, it can put pressure on the public institution to process and respond to the request. You can update the information as and when you get a response to the request — or if the deadline passes and there is no response you can make this into a news story as well. Doing this has the additional benefit of educating members of the public about the right of access to information and how it works in practice. If your colleagues are sceptical about the value of access to information requests, one of the best ways to convince them is to write a story based on information you obtained using an access to information law. Mentioning in the final article or broadcast piece that you used the law is also recommended as a way of enforcing its value and raising public awareness of the right. If you want to analyze, explore or manipulate data using a computer then you should explicitly ask for data in an electronic, machine-readable format. You may wish to clarify this by specifying, for example, that you require budgetary information in a format “suitable for analysis with accounting software”. You may also wish to explicitly ask for information in ‘disaggregated’ or ‘granular’ form. You can read more about this point in this report.